Should I let you into a little secret?? I detest anything camomile - its just the scent - horrid. 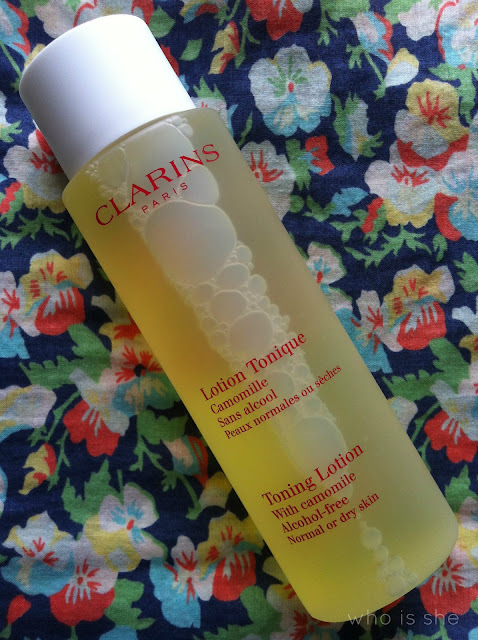 Anyway every time I see my favourite Boat Laura she's always buying Clarins Toner - seriously she must drink the stuff. Anyway I've been wanting to try a Clarins toner for ages and as I bought this way back last year when my skin was going through a really bad phase (note I have only opened this over the last few months) and this is what the lady on the counter recommended. What I love about this toner is the fact that it contains no alcohol and doesn't dry my skin out, unlike other toners I can mention. Obviously I'm not keen on the scent however this doesn't translate onto the skin. Personally I'm more of a fan of spritzer toners and what I've done with this is decant it into a Ickles Bottle spray bottle and used that. This way I don't waste product and can spray it direct on my face to cool down - this has been especially vital over the last few days with the heat in Durham. Would I buy it again? Potentially however I feel like there's more toners out there to try, if that makes sense?